Officials from the government and the ruling Democratic Party (DP) agreed on Feb. 5, 2019 to conduct an investigation into the death of a young contract worker at a thermal power plant in December, party officials said. Kim Yong-gyun, a 24-year-old subcontract worker, was killed in a conveyor belt accident in mid-December at the power plant in Taean, about 150 kilometers southwest of Seoul. 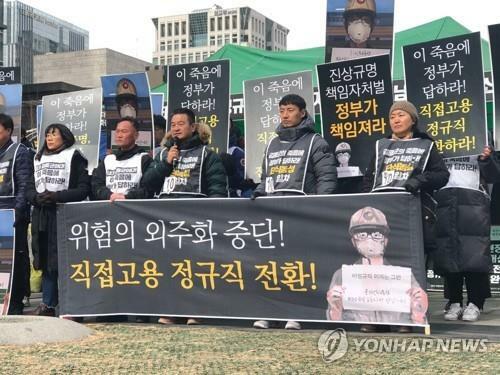 A civic group holds a press conference on Jan. 31, 2019, in central Seoul, calling for the punishment of those responsible for the death of Kim Yong-gyun, a subcontract worker who was killed in a conveyor belt accident in mid-December at a power plant. His death sparked public anger about the treatment of temporary workers. It also prompted the National Assembly to pass a bill aimed at strengthening industrial safety measures last year. Government and DP officials made the agreement on Feb. 5, 2019 to operate a joint committee to look into the case and come up with a result by June 30, they said. The committee will draw up measures to ensure the safety of irregular and contract workers, the officials said. The Ministry of Industry, Trade, and Energy also announced that it will extend the current three-year contract period for non-regular workers at power plants to six years as part of efforts to prevent the recurrence of similar incidents. Kim's funeral, meanwhile, will be held on Feb. 7, 2019 for a three-day run following the agreement, a civic group said.